The other day someone asked me how to weld metal without a welder. I immediately thought about the possibilities if I just expanded my thinking for a moment. Now let’s think about this for a second; what exactly is welding? Well, the short answer is this: bonding two pieces of metal together, according to Wikipedia. So we can’t exactly bond to pieces of metal together without enough heat to melt the base metal, but we can bond metal together in other ways. 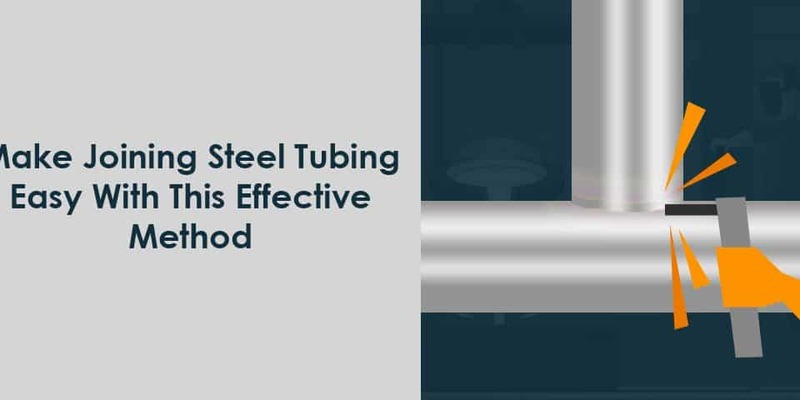 To “weld” metal without a welder, you can join the pieces mechanically, use a spline or smaller piece of tubing to join tubes together or braze certain metals like Aluminum. To braze metals you’ll need a torch to heat the base metal and to melt fuller metal in between the joints you want to connect. So I offer the distinction because you’re not actually welding – but you can produce a solid joint for many different uses at home or on a job site. 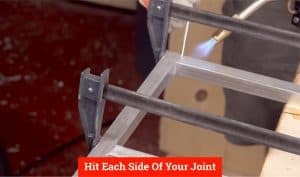 In fact, sometimes it’s easier, cheaper and faster to make a mechanical joint or a brazed joint. Now, we have a lot to ground to cover with this article, so pull out a pen and take some notes cause we are going to cover some skills you’ll be sure to use. Every great project had a solid foundation and great plans to back it up. So, before you even touch a torch and get ready to braze take a few minutes to prepare your workspace, review your plans and gather your materials. If your looking for some great metalworking projects you can also check out this resource. 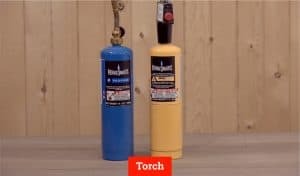 Torch – either the yellow or blue will work, but try to get the blue one – it’s hotter. Heavy Duty gloves – you’ll be working with Molten metal! Denatured alcohol – to degrease and prep your metal for the weld. 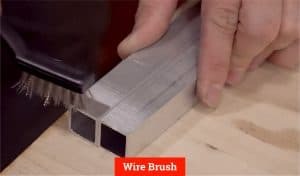 File – a worthwhile investment for any metal working you’ll be doing. Ok, now that we have everything you’ll need and your workbench set up, you’re ready to go. By the way, if you don’t have a good welding table, check out this free plan to build one. 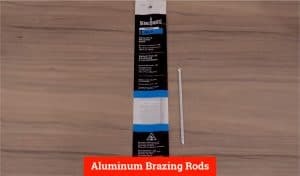 Brazing is an effective method to use for joining metal, especially if you are building something like home furniture, desks, or anything that does not need to support an extreme load. Also, if you are interested in a full explanation of brazing, read this. 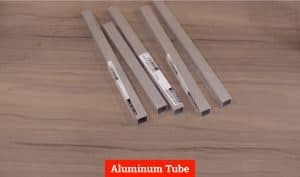 Grab your Aluminum and make sure you cut it to length. 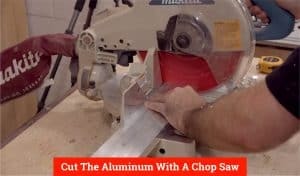 The best tool to use here would be the chop saw – and since Aluminum is soft you can even get away with using a general purpose blade and not a specialized metal cutting blade. Pro Tip: Notice how we just cut several lengths of Aluminum at once. 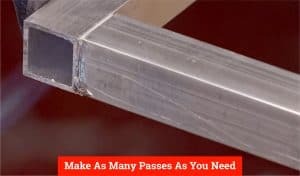 This is commonly done in fabrication shops to save time, especially when you need several lengths cut at the same size. This can also be used in your home shop too! It’s also called a gang cut. 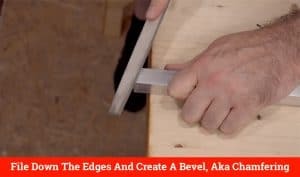 You’ll want to file down the edges and create a bevel, aka chamfering. 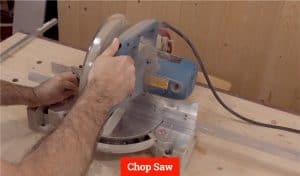 You can use a hand file or a very fine grit pad and an angle grinder. I recommend a file in this situation because Aluminum is so soft. 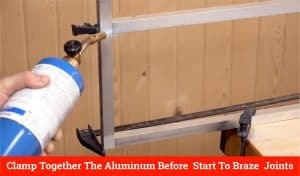 Clean your aluminum and prepare to braze. Take a wire brush and pass it over your metal on and near the point you will be brazing. I would also hit it quickly with some denatured alcohol and a shop rag – just to remove any dust, grease or oils that may be on the surface. Remember – contamination can severally weaken a joint. Clamp together your aluminum before you start to braze your joints. You want to make sure everything is level and sit flush together – that way your project will be solid and well made. 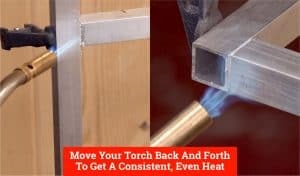 You want to heat the metal surrounding your joint and get it “warmed up” Aluminum melts at 1200 degrees and out filler rod will melt at about 700 degrees – so you’ll need work in small sections (one joint at a time) and move your torch back and forth to get a consistent, even heat. Gently running it down the channel you made earlier with your file. 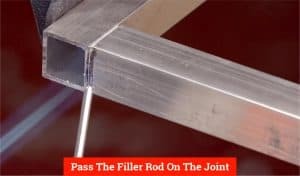 You’ll know the metal is ready because your filler rod will melt evenly. If you are getting chunks of metal, then warm up the base metal a little bit more. And once it’s level – pass the torch over the joint once or twice to melt away any sloppy edges and clean it up a bit. And you’ll repeat these simple 6 steps throughout your project on each joint that you have. Remember to hit each side of your joint – with tubing this will be all 4 sides – so you have a strong joint for your finished project. Now, let’s say you just don’t want to braze your metal, then here is a resource you can read which will give you a lot of different ideas on how to join materials together. In this how-to article, you learned how to “weld” metal without a welder. Actually, you learned brazing, which can be considered the cousin of welding. You are joining metal together using one of the oldest metalworking techniques known to man – and an essential skill when working with soft metals like brass and bronze. 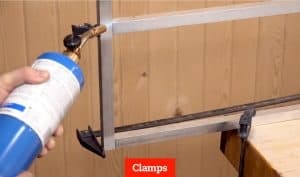 Plus Brazing is really useful because you can complete this project in a small space without the electric you would need for a welder – so it’s a great skill to have for the DIY crowd.